For digital health transformation to skyrocket, teamwork is key. At inDemand, we believe that no one is an isle and we need to promote a collaborative ecosystem for innovation to happen. 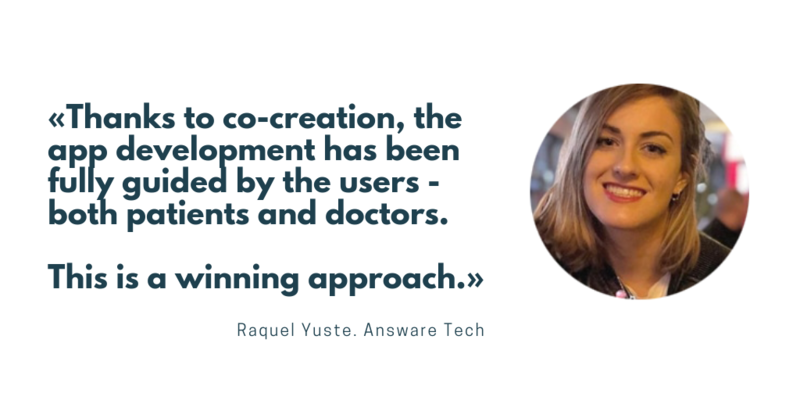 We’ve discussed with Raquel Yuste from Answare Tech about co-creation and team building between startups and healthcare professionals. Answare Tech is one of the digital health companies that have participated in the first iteration of the inDemand project, solving the challenge called EPITIC that was launched in the Region of Murcia. Let’s know more about their solution and their experience with co-creation. Answare Tech is an innovative Spanish SME specialized in software development for strategic IT areas – Monitor & Control of infrastructures, mobility, GIS and 3D/VR. eHealth is one of the sectors we work in, developing solutions like VirTEA, virtual reality to support people with autistic disorders when dealing with stressful situations, like visiting the dentist. The Hospital Santa Lucía, based in Cartagena (Murcia, Spain), wanted to have an online channel to communicate with their epileptic patients, in order to support the everyday small consultations that are common for this kind of diseases. The physicians also were looking for a tool to collect information related to the patients’ habits, so that they could check it at a glance. We proposed a mobile app with a chat service for epileptic patients, so they could directly text their doctors with questions about their treatment. The physicians answer them through a web platform, in order not to be interrupted in their personal time. The goal is to improve communication and save time. The EPICO app also gives doctors the possibility to share useful information for epilepsy management (like news or videos) and includes a calendar where patients can voluntarily update their medical information – for instance, the number of crisis, nutritional habits or physical daily activity. 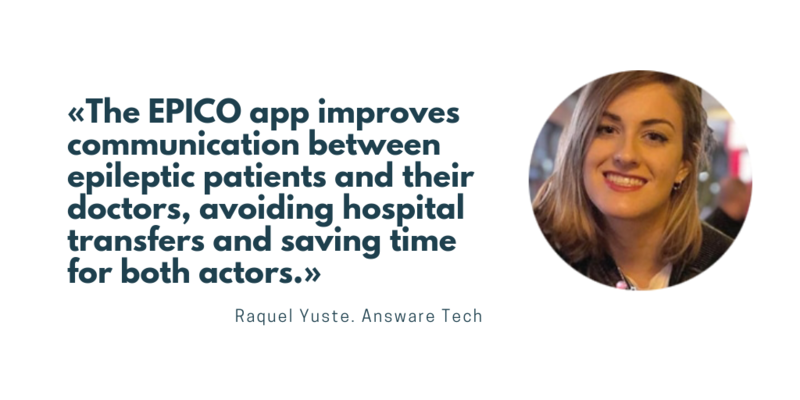 “The EPICO app improves the communication between epileptic patients and their doctors, avoiding hospital transfers and saving time for both actors”. We feel very happy and lucky with the healthcare professionals we have been co-creating with. They have been so active! The feedback from both, doctors and patients, has been fluent and with a very positive approach during all the process, working as a team. We really can say that the development has been fully guided by the users. Another benefit of co-creation is that, from the very beginning, you receive all the information needed about the disease and the problems to solve. This knowledge is pure gold for companies and it also saves time. From the very beginning, we shared visual proposals and mockups to avoid using a very tech language. This approach has been very successful. As an insight, we have realized how important is to define very well the red lines of the development. Otherwise little improvements or new functionalities will constantly be suggested, therefore turning co-creation into a neverending process. “From the very beginning, we shared visual proposals and mockups to avoid using a very tech language with physicians and patients”. 6.- What is your go-to-market approach? Why has the business support received been useful? When you are so into development sometimes you feel like you don’t have time to focus on the commercialization. The meetings with Ticbiomed helped us to detect who we need to contact and to define a guide to follow. Related to the market approach, we will personalize the EPICO app for other chronic diseases. We already have the right tool and there’re many patients that could manage part of their healthcare assistance by chatting with their doctors. 7.- Why do you think digital transformation in healthcare pays off? As citizens, we all benefit from technology in areas like leisure or shopping, but this is not happening in healthcare. There still exists a huge knowledge gap within the healthcare sector about the benefits of digital transformation, and that’s why they don’t invest in eHealth as much as society needs. No doubt: Digital Health saves time and money to patients and healthcare providers. Challenger: Servicio Murciano de Salud, Hospital Santa Lucía.